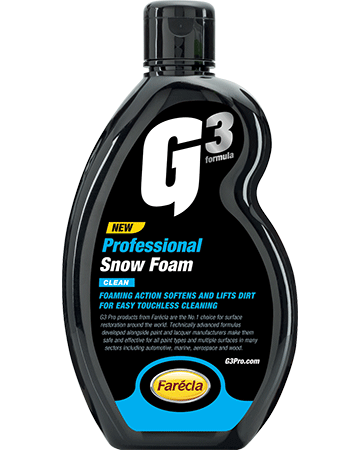 G3 Professional Snow Foam is a pH neutral cleaner, safe for all surfaces and paint ﬁnishes. It is ideal for touchless cleaning before full exterior work and doesn’t strip off previously applied sealants or waxes. High foaming action softens and lifts dirt, making it easier and safer to remove damaging particles without touching the surface. Use before the shampoo or wash & wax stage.